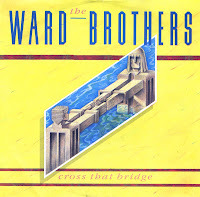 The single 'Cross that bridge' by the Ward Brothers was released when the cd-single format had just come around for the first time. In the summer of 1987, the cd-singles of 'Cross that bridge' were in the discount bins, because the single didn't make the impact the record company may have hoped for. In the end, I didn't buy it, although on a few occasions I almost did. 'Cross that bridge' was a single taken from their debut (and only) album 'Madness of it all'. The single reached number 32 in the UK singles chart and the Dutch Top 40.